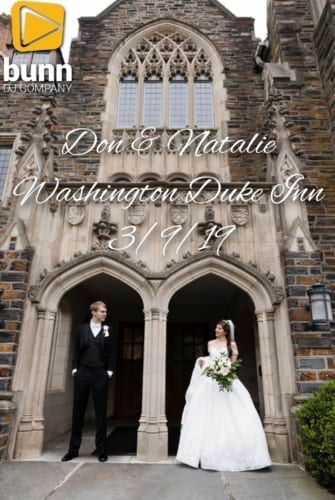 Natalie and Don are two of the nicest and most laid-back people I have played for and I was thrilled to be their wedding DJ on March 9that Washington Duke Inn in Durham, NC! The ceremony was held earlier in the day at the beautiful Duke Chapel. After the service the 140 guests had a few hours break to relax before the wedding reception. Their cocktail hour was held in the hallway outside the ballroom where I was set up. After pics and video were taken by James from Walters and Walters and Elijah from Morgan Scott Films, the doors to the ballroom opened and guests found their seats. The room looked beautiful with floral arrangements by Tre Bella. I left music playing and went back out to the hallway to line the wedding party up. I introduced the parents to “Take On me” by A-Ha and wedding party to “Delirious” by Steve Aoki. Natalie and Don came to the floor and had their first dance to “All Of Me” for a couple minutes and then I invited the wedding party to join them on the floor. After they were on the floor, I changed songs to “You and Me” by Lifehouse to surprise her Sister and husband with their first dance song. So sweet!! The parents’ dances followed after the wedding party took their seats. Natalie and her Father danced to “Can’t Smile Without You” By Barry Manilow. They sang it to each other like they had the hundred times when she was a child. Don and his Mother danced to “You Raise Me Up”. Her parents welcomed everyone and Bob Vietor blessed the meal. During dinner I played a mix of light classical music. After dinner we had toasts and the Ashley Cakes cutting to “Happy Together”. I LOVE that song (and Ashley cakes!!)!! We paused for 15 minutes so guests could enjoy the 4 different flavors of cake, then we had the bouquet and garter toss. I invited the single ladies to the floor for the toss to “Dear Future Husband” and garter toss to “Get Lucky”. Before opening the floor to everyone, we had an anniversary dance to “Love Me Do”. It was so great and came down to 2 couples married a year apart. I opened the floor to everyone with “Build Me Up Buttercup” and “Twist and Shout” that shortly filled it with young and old. Some top 40, 80’s and EDM kept them dancing for the next hour before the last dance. We ended with “This Is How We Roll” by Florida Georgia Line and an exit to a convertible Mustang waiting for them just outside the doors. Guests took cupcakes from a cupcake bouquet as a favor on their way outside. Thank you so much Natalie, Don and your parents. I was thrilled and honored to play for you and your guests!